Home→EMOTIONS→angst→Is This How it Starts? What if my life has been lived? What if I’m now going to settle into that twilight of routine and isness? What if the main dish has been served, and all that’s left is the dessert and the check? It’s not as if I feel I need new adventures or challenges. I WANT things to slow down. In fact, I could not withstand more of what I’ve already endured. But the really sobering aspect still remains. I lived most of my life. That was it. Like John Lennon said, that thing that happened while I was busy making other plans. And where did it all lead me? To exhaustion. To heartbreak. To stress illness. To being alone again. Maybe my current situation seemed so good because of the path I took to get here. Because simplicity and relative comfort and security seemed stellar in comparison. But how long before the sadness creeps in and sets up a permanent camp in my psyche? What if I am just alone again, marking time until I see my last sunset? I was trying to have a nap when this thought occurred to me. And instead of napping I eased into a full fledged anxiety attack. Seeking the solace of logic, I wondered what triggered it. I thought back to what I was doing just before I put the sleep mask on and pulled the lambswool comforter up to my chin. I had started on a new print proof. I had read the first chapter of Plethora. Then I realized. That was the trigger. It was probably the book closest to a roman a clef. I had literally and literarily split myself into two characters and used a great deal of real events and backstory for them. So knowing that bit about where I had been, reflected back from a page but knowing how close it was to memoir, and being reminded of that fact – I realized I was closer to my death than to my birth. And foreboding came slithering out of my amygdala to whisper in my ear. What if you’re not going to beat this adrenal exhaustion? What if you’re not going to get better? What if you only came here to die? And me, without my Xanax. I got up, again, not wanting to create associations of panic with the bed, any more than i wanted to do that with sleeplessness. I grabbed the unopened bottle of Merlot from the fridge. But getting it open was almost more stressful than all the rest of it. Finally, I got it open and poured some in a goblet, and some down my throat. Get a grip, Jae. This is not how you want to be. Sitting down at my desk, I look out the window. The neighbor is raking leaves. Leaves that will only be replenished in a day or two. Fruitless, really. 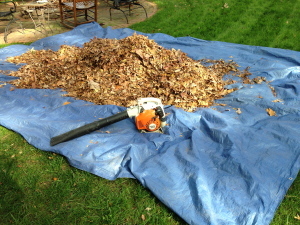 He drags piles of leaves on a tarp, and it looks like he’s dragging a body. It’s a very pleasant 71 degrees outside, but I’m still cold. I’m still in my flannel overshirt. Lounge pants. Thermal socks. Plastic Croc-knock-offs, unbrushed hair. Thinking incessantly about that new kitten I’m going to get. Missing the overt affection from that delightful polydactyl cat, Monkey, I had to re-home to be with the woman who ripped my heart out of my chest and handed it to me, still beating, in her fist. So this is how it starts. The beginning of Crazy Cat Lady status. Reading your post and the comments above gives me great insight to life. Which just seems like a bunch of hooey right now! I know it to be true that life is what we make of it. But I have spent half my life being with others. Trying to be happy by making them whole. I never really found myself. I believe I was close once but perhaps I am a little codependent myself or just making excuses… I never had any encouragement or support from those I cared about. If anything I got was discouragement. Irk! I accidentally clicked post comment before I was done with that. Well, I hope you have a great rest of your week, whatever that may be for you and I will be looking for any other books of yours I have not yet read… I don’t think there are any left but there could be. I am reading your essays too now and am getting lots of laughs from dubya dubya … I concur with all of your thoughts! Keep your chin up and keep smiling!! Thanks Tanya. I have 42 books, but a few of them are currently unavailable while i update my catalog of work. And of course, i will continually be writing more. Thanks for your support! Hi Tanya. Thank you so much for your thoughtful response. This Universal Humanity we all share–I’ve always felt it was fruitless to pretend we don’t have the same pain, the same emotion that everyone else does. I am compelled to share mine, and it is cathartic as well as a statement of self-acceptance. This is life, This is how hard it can be. But maybe by putting it out there, someone else will be able to say that, too, and this will lead to some type of closure or understanding, and allow them to carry on with their head held high. I’m familiar with that path. It seems you’re destined to do nothing but pet your cat, drink some wine, write some pages, get some coffee, lather, rinse, repeat. But I truly believe that if we weren’t meant for more, we’d have already left this life. Life has more for us. Just remember to be gentle with yourself. Bleak. But the thing I have noticed about you lately, you are finding yourself. I think perhaps you got lost a little. You wrapped yourself up in someone else who used you, used your creativity and your warmth, and stupidly discarded you. Your strength was leeched, you are getting it back. You are dynamic, strong, and have so much left. Besides…crazy cat ladies rule!